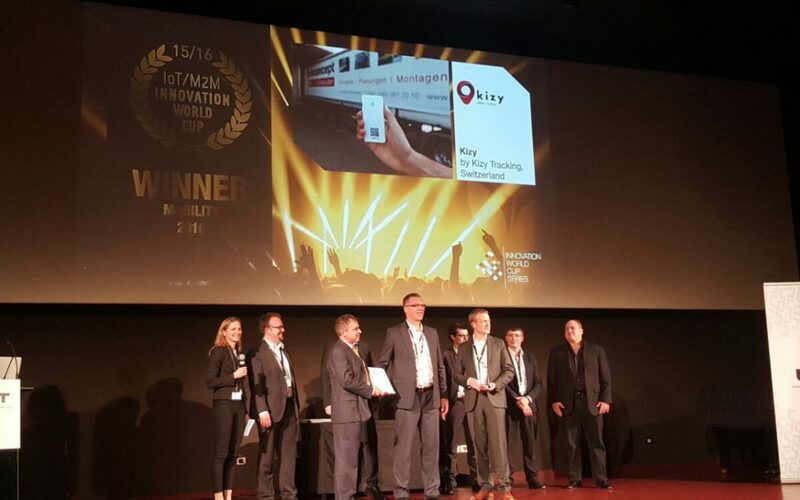 Kizy Tracking wins the IoT/M2M Innovation World Cup! After a crazy week at the Mobile World Congress in Barcelona, during which we had the opportunity to take the pulse of the mobile connectivity ecosystem and establish contacts with telecom operators, we took part yesterday to the final of the IoT/M2M Innovation World Cup in the category “Mobility”. We have found an immediate positive resonance within the telecommunication operators present at the Mobile World Congress by demonstrating how their existing infrastructure can help solve some of the global supply chain’s biggest challenges. The IOT / M2M Innovation World Cup is the leading Internet of Things/Machine to Machine award worldwide. This year, 400 contestants from 58 countries demonstrated the huge innovation potential in the world of machine-to-machine communication and the Internet of Things. This leading global innovation competition is welcoming revolutionary IoT/M2M solutions in the categories “Connected Home”, “Smart City”, “Mobility”, “Security”, and “Healthcare”. An international panel of industry experts selects the most innovative products according to criteria such as level of innovation, marketability, and usability. It’s not every day that you can say you are a world champion. We are therefore extremely happy to share this new achievement with you!